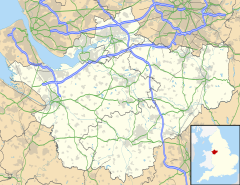 Hollins Green is a village on the eastern edge of Warrington, England, close to Glaze Brook, the border with Salford, in the civil parish of Rixton-with-Glazebrook; the ecclesiastical parish is Hollinfare.. The village has two pubs, the Red Lion and the Black Swan, a post office, village shop, barbers and community hall. The village houses St Helen's CofE Primary School as well as the Pre-School, which moved from the Community Hall to St Helen's at the beginning of the academic year in 2015. Children of Hollins Green generally attend Culcheth High School upon leaving St Helen's, as it is one of the feeder schools. A milestone along the former Warrington and Irlam Turnpike, now known as the A57 Manchester Road. The opposite side of the stone gives the distance to Warrington. Rixton Clay Pits is located at the west of the village and is an old clay extraction site; it is now a nature reserve and a Site of Special Scientific Interest. The Manchester Ship Canal runs across the southern border of the village, utilising a partial stretch of the River Mersey. The village also contains a Brick Works, the moated site of Rixton Old Hall, Rixton New Hall, Ramswood Garden Centre, St Helen's Church (C of E) and churchyard (on an ancient circular site bordered by a footpath called 'The Weint'), a cross commemorating those killed in both world wars, a Methodist chapel, a blacksmith and a cemetery. A five kilometre road race, the Peter Lowe Memorial Hollins Green 5k, is held in the village on the first Saturday of June each year. Organised by Spectrum Striders Running Club, the course takes in country lanes through Hollins Green and Glazebrook and regularly attracts over 200 runners. The race forms part of the North Cheshire 5k Grand Prix series. This page was last edited on 12 August 2018, at 09:04 (UTC).